feta cheese (I prefer French sheep milk feta, it is less salty and softer) If you won’t be using this kind, your dish will be saltier, so use less salt in your preparation. Heat ¼ cup or more of olive oil in a non–stick or well–seasoned cast iron pan on medium heat. Slice the eggplants lengthwise in long thin oblong strips about 3–4 per eggplant. Slash them with a knife on the pulp side two or three slashes per strip and give them a quick slight dash of salt. Place them in the hot oil and fry them until they are reddish brown on both sides. Layer them into a glass baking or other nice baking dish, one layer only, so use a larger dish if you need to. Grind fresh pepper over each wedge. When all the eggplant has been fried, empty the oil out of the pan and grate the tomatoes, with a cheese grater over the pan, this is the quick way to peel tomatoes, because the skin stays in your hand and the pulp goes in the pan. Heat the tomato pulp on medium for awhile. You are trying to burn off the liquid, stir frequently. You shouldn’t need to add olive oil, because the pan was previously coated in it. Add the pressed garlic and a dash of salt. Let this cook down until it’s mostly a thick pulpy sauce, not too watery, 20 minutes perhaps. Spoon the tomato sauce over the eggplant and sprinkle the dish with the feta. Cover with an oven–safe lid or aluminum foil and cook in the oven at 375º for about 20 minutes. Serve with a nice fresh salad and some corn on the cob and good bread to soak up the juices. All the eggplant dishes I cook require the following knowledge; picking the proper eggplant is what makes the difference between a dish that is bitter and one that is sweet and lovely tasting. 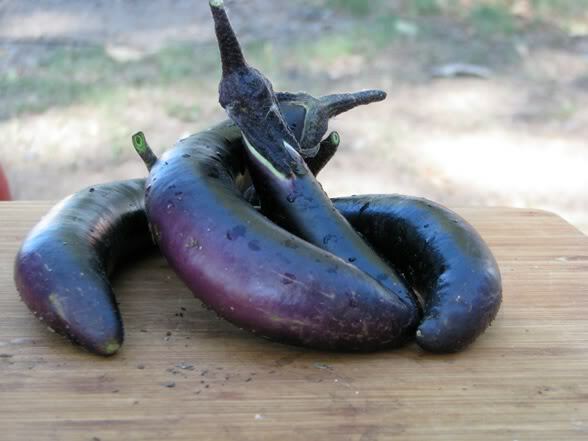 Whether the eggplants are Japanese style or your traditional fat purple variety; the key is how heavy they are. The only proper way to pick an eggplant is to get involved in the veggie bin or with your farmer. If you are at your local market you may need to rearrange or make a mess for the grocery clerk to deal with. I actually recommend budgeting the time to arrange the eggplants back when you are done so as to ensure future harmony between yourself and the person who stocks your groceries. The deal is, you have to pick up every eggplant and compare it with every other eggplant. The heavier ones go in the reject pile, the lighter ones go in the keep pile. If there are ten eggplants and you only want three, after you’ve selected the five lighter ones, repeat the process with your remaining five until you’ve got the three lightest eggplants. If they are all heavy, make a different dish because it just isn’t worth the time and effort. All the eggplant recipes I know take hours to make, (with the exception of this recipe and Baba Ghanoush) so if you don’t have a good eggplant to start with, why bother?